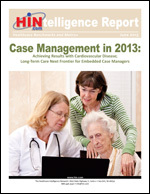 Free Download: Case Management in 2013. Explores emerging models of episode-based payments, physician-hospital organizations and physician bonus structures. Reserve your PDF or print copy today. "Hospitals are increasingly going to become cost centers, which stresses the need for hospitals to engage physicians in a discussion about how to prepare for this, how to look at setting up a PHO." Watch the webinar today or order a training DVD or CD-ROM.